Manganese Bronze has been making the distinctive black cabs since 1948. LONDON (Bloomberg) -- The Mercedes-Benz Vito and Nissan NV200 could become London's taxis of choice as the maker of the city's famous black cabs fights bankruptcy. The Mercedes and Nissan models, which are based on commercial vans, could end five decades in which the black cab silhouette has become known to millions from films, books, postcards and a star turn in the 2012 Olympics. But some cab drivers say the rival models don't measure up. "That isn't a London cab and never will be," Michael Beere, a taxi driver for 14 years, said on a rank outside the Liverpool Street railway station while stabbing a finger at silver Vito. "It's a people-carrier." Manganese Bronze Holdings Plc., which has made taxis in Coventry, England, since 1948, entered administration last month after a Chinese tie-up failed to yield savings needed to secure the company's future. The move followed a decision to recall 400 of its TX4 cabs, which had steering faults. London has almost 23,000 licensed taxis -- those that can legally be hailed in the street. About 1,400 new ones are registered each year, according to Manganese Bronze, a market worth about 50 million pounds ($80 million) annually. 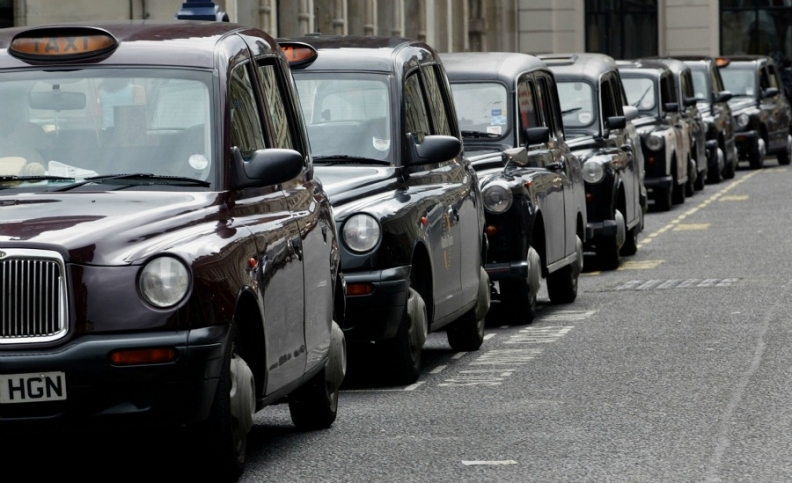 The company says it has supplied more than 100,000 of the taxis over the past five decades. Known as hackney cabs from their origin as horse-drawn coaches, their drivers must pass a four-year "Knowledge" test to demonstrate an encyclopedic understanding of 25,000 streets and 20,000 landmarks across the UK capital. Regulations first developed by London's Public Carriage Office in 1906 and updated just a few times since require cabs to have a 8500mm (336 inch) turning circle, 1295mm (51 inches) of internal headroom, separate passenger and driver compartments and a ramp for wheelchair access. The Manganese TX4 meets those specifications. The only other car to do so is the Vito, sold as a cab since 2008. After assembly in Vitoria, Spain, the Vito is shipped to Coventry where a company called Eco City Vehicles Plc. makes changes to meet London's requirements. While only about 7 percent of London taxis are Vitos, the car's share of new registrations is higher. The Vito captured 23 percent of sales last year, or 355 versus 1,074 for the TX4. In the first half of 2012, the Vito's share jumped to 38 percent of the market, or 324 taxis. "Manganese Bronze has traded on the idea of being an icon for a long time," said Eco City CEO Peter DaCosta. "I don't believe the icon is the cab. It's the cab driver." Next year, Nissan will introduce a modified version of the NV200 that meets London's licensing rules and includes cab-friendly modifications such as extra-durable interiors. Nissan says drivers will prefer the NV200 because it achieves the required turning circle with a standard front-wheel steering system. The Vito, by contrast, reaches the tight radius with rear wheels that also turn when the car is moving slowly. Nissan could also benefit from having supplied engines to the final version of the fabled FX4, which Manganese Bronze built for 39 years until 1997. "We've got ambitious plans to be a very prominent player," said David Jackson, who heads the NV200 cab program. The troubles faced by Manganese, he said, could spur Nissan to accelerate introduction of the cab, currently scheduled for the second half of next year. Nissan also plans to use taxi sales as a springboard for electric technology on which it has spent 4 billion euros ($5 billion) with partner Renault. A battery-powered NV200 may enter production in Spain by 2014, boosting London Mayor Boris Johnson's plan to make the city's cabs all-electric by 2020. Manganese Bronze is fighting for survival after going into administration -- a form of creditor protection -- on Oct. 30 following the discovery of defects in steering boxes provided by China's Geely Automobile Holdings Ltd. Geely has a 20 percent stake in Manganese following a 2006 joint-venture deal under which the UK company buys China-made components and body parts for assembly in Coventry. The Chinese partner is allowed to build cabs for sale across Asia. The steering problems led to a recall and production freeze, cutting off cash flow. More than 150 jobs have since been cut from a workforce of 274 and Manganese's stock has been suspended since Oct. 11 after dropping 69 percent for the year. The latest crisis follows a succession of shocks including a 4,400-car recall after engine fires in 12 TX4s, threatening to overwhelm a company that hasn't posted a profit since 2007. The business suffered a pretax loss of 3.6 million pounds in the first half of 2012 as revenue dropped 11 percent. "These problems arose because Manganese is an old-style manufacturer," said Steve McNamara, general secretary of the Licensed Taxi Drivers Association. "They're building a cab in a shed really and just don't have enough resources or money." Still, toppling Manganese remains difficult, given the loyalty of many cabbies to a brand so familiar and enduring that it was chosen to take center stage at the closing ceremony of the 2012 Olympic Games. "I've looked at the Nissan and Mercedes and the trouble is they are converted models," said John Dixon, 63, a cab driver for 26 years. "A London taxi shouldn't be an everyday car. In a Vito you are just the same as everyone else." Manganese Bronze's survival prospects were boosted on Nov. 15 when the company said it had solved the steering fault and that recalled cabs would be back on the road by mid-December. Administrator Matthew Hammond, a partner at accountants PricewaterhouseCoopers in Birmingham, England, said some potential purchasers have come forward, lured by a global reach that last year saw Azerbaijan order 1,000 taxis to be built in China. A short period in administration will provide a fresh start, and in London some cabbies are unlikely ever to accept alternatives to a vehicle they view as a professional "qualification" that sets them apart from the crowd, Hammond said. "They have a different view of themselves in a black cab than in a van," he said. "I'm hopeful that investors will take the company forward so it can continue to make cabs for this and the next generation of drivers."